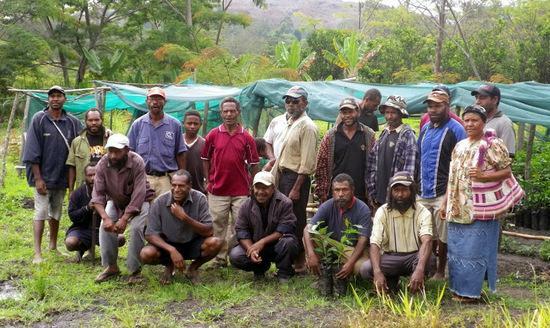 Korofeigu Farmer's Cooperative Society is located in the Bena Bena valley of the Eastern Highlands between Goroka to the west and Henganofi to the east. The Coop is comprised of 97 members (some of whom are seen above near a nursery), with a total cultivation area of 112 hectares. The mountainous, moist cultivation area has loamy soil and a variety of native shade trees. Annual production is around 1.6 containers. In early 1945, as the war in New Guinea was subsiding, four village plots in the Korofeigu area were identified by the administration for coffee planting by the villages.Thirteen teenage villagers from Korofeigu and other surrounding areas were selected to be sent to a newly created school for training in coffee production. For the next 12 months, government officials moved around the Eastern Highlands selecting village plots and encouraging them to plant these seedlings while continuing to train the youth of these areas. The initial reaction of the indigenous population was of indifference; in a bountiful valley that could produce so much, it was thought that a crop that would take 3 years to harvest a return was a waste of time. Although some plots were neglected, none were removed, allowing the beginning of a coffee farming culture in this area. From these small plantings in and around Korofeigu, coffee would become the most important commodity in the development of the New Guinea Highlands. Today it is Papua New Guinea's most important agricultural crop, directly or indirectly providing the major source of income for a third of the country’s population. Our supplier, New Guinea Highlands Coffee Exports, has had business relationship with farmers in the Korofeigu area since their inception in 1992, but members of the company have been trading coffee within the area since the 1960s. Recently, NGHCE along with Lyndon Sabumei (a third generation coffee farmer) have begun a program to assist farmers in obtaining their Organic Certification. This coffee is the product of this initiative, which also provides extension work on HIV/AIDS, financial management, gender equality, coffee husbandry and certification standards & procedures.